In Chapter 2, "Consequences and Evolution: The Cause That Works Backwards," author Susan M. Schneider places evolutionary theory in terms of the science of consequences. Not many birds can upstage fifty pink roseate spoonbills and a supporting cast of thousands of shorebirds, pelicans, gulls, terns, egrets, and herons—even a regal peregrine falcon cruising by. I had spent an hour paddling the mud flats of the Everglades, barely navigable at low tide even for my kayak. Now, bobbing in the water at a distance, hoping against hope, I was panning through all the spoonbills with my binoculars when I noticed a distinctly different pink bird in the background. I knew immediately that this was one of the holy grails of Florida birding: an adult greater flamingo. Paler, younger flamingos foraged nearby. I watched for about an hour, pinching myself. At closer range, I could even make out details of that unique boomerang-shaped bill. The flamingo’s bill is a classic example of behavior leading evolution. Irresistible little crustaceans of the briny bays reinforced the probing of the flamingo’s predecessors, despite their originally clumsy beaks. Given enough time in this rewarding niche, genetically based structural changes in that beak followed. Darwin’s finches provide another famous example. In the Galapagos, the one pioneer finch species that settled these distant islands had all sorts of foraging opportunities, and “radiated” into over a dozen different species that often specialized in habitat, foraging style, or both. Foraging on big seeds, for example, created selection pressure for thick, husk-cracking beaks, because birds with bigger beaks had an advantage in survival and reproduction. For finches that pursued insects, thinner probing beaks were selected instead. “Sympatric speciation”—species separation without geographic isolation—is less common than geo­graphically based speciation, but under the right circumstances, it can and does happen, and it clearly happened in the Galapagos. If small-billed birds were more likely to mate with each other than with large-billed birds—perhaps simply due to spending more time in different habitats—then the stage was set. The tables turned in these cases: once the ability to learn from conse­quences had evolved, it became an important driver of evolution. Different foraging styles for different food rewards in different habitats helped lead to different beaks. 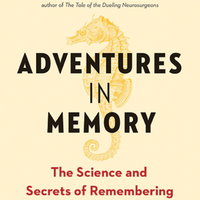 The behavior followed the consequences, and genetic change then followed the behavior—something even Darwin knew was possible. 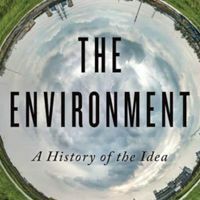 It’s no different, in essence, from the way that the development of ancient oxygen-excreting bacteria brought our planet a whole new kind of atmosphere. Modern life could not have developed otherwise. Consequences also opened up whole new vistas as evolution proceeded. The principle is pervasive and it continues to operate today. In the Pacific Northwest (as well as elsewhere), orca whales with different feeding habits have recently been suggested to be separate species. “Transient” orca pods roam widely after marine mammals like sea lions, while “resident” pods stay closer to shore and chase fish. 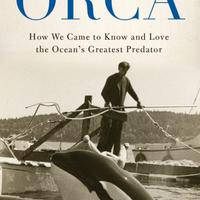 “Offshore” orcas are like residents, but they travel much farther offshore. They all behave differently, and the three types—tran­sient, resident, and offshore—avoid each other: Genetic analyses show that these groups of whales have not interbred for many generations, although they still could. Their dorsal fins look different, too. Which change came first? 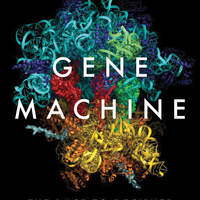 Perhaps behavior again helped lead the way to ultimate genetic change. Some species go one step further. They don’t just choose a niche because of the consequences found there, they construct the niche. Once in it, the same processes produce adaptation to that niche. Beavers are a classic example of busy niche constructors, but we can look a lot closer to home. When people domesticated cattle, milk became a staple food—except that the ability to digest milk’s lactose is usually lost after early childhood. What do you do if milk is all that’s available in your herding society? Or you live in the northlands, layer clothing in the winter, and need the extra vitamin D that the sun no longer provides—but milk does? With enough variability in gene regulation—a change in timing is all that’s required—and with enough selec­tion pressure, it’s not surprising that these clans developed extended lactose tolerance. But the behaviors and their consequences came first. They provided the critical selection pressure. If behavior-led genetic change seems unexpected, it’s only a consequence of the unusual way that both natural selection and behavioral consequences work: selectionism. It’s not a straightforward process, like dominos. If you topple one domino, it topples the next, and on down the line: A causes B causes C, in order. The underlying principle of selectionism, however, is different: success is reproduced; failure isn’t. The force of selection is thus a cause that works backwards, in a sense. Suppose you are eager to learn to make a free throw in basketball. Your initial efforts might be generally accurate but lacking in force, so your tosses fall short. Weak attempts disappear as a consequence, while forceful ones get rewarded with success, or at least balls that get close to the basket. (Hey, even the pros don’t make every free throw.) The next time you shoot a few, you’ve gained some skills. Strong tosses are in, weak ones have been weeded out. The variations came first, the selection second, followed by the effect on your evolving basket-tossing repertoire. Darwin noted that living things didn’t just copy themselves once, they produced extra young that differed from each other. Finite resources meant that not all would be able to survive and reproduce, and “natural selection” ensured that those less fit (or just unlucky) lost the race. A blind robin hatches and then, as a consequence of its defect, perishes. As in learning from conse­quences, the variations come first, the selection second. Third is the effect on the robin gene pool: Genes that help to cause defects are weeded out. Genes that contribute to fitness—or are at least neutral—stay in. Learning from consequences developed because it proved to help fit crea­tures for the everyday struggle of life: behaviors that succeed (that achieve reinforcement) are repeated, behaviors that fail disappear. Consequences modify behaviors across days and years, just as they alter species across cen­turies and millennia. Consequences in turn were selected. Injuries feel bad because animals that didn’t avoid injury didn’t survive. Pain, sad to say, was necessary for survival. But so was pleasure. Take this one step further. Food tastes good because animals that liked eating survived. We ourselves don’t have to learn to appreciate sugar or fats (more’s the pity in these days of plenty for the developed nations). But our ancestors who found them rewarding were more likely to survive. The connec­tion to the simple rewards of flatworms is evident. B. F. Skinner was one of the first to note the parallels between the science he founded and natural selection in evolution. Just as in evolution, there’s both positive and negative selection. Positive selection increases the frequen­cies of advantageous genetic variants, as reinforcers strengthen the behaviors that produce them. Negative selection weeds out what causes harm, much as negative consequences diminish behavior. Neutrals are in between, sometimes flying under the radar for years. 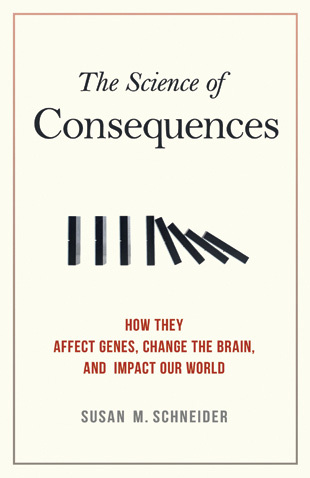 Reprinted from The Science of Consequences: How They Affect Genes, Change the Brain, and Impact Our World, by Susan M. Schneider. Copyright © 2012 by Susan M. Schneider. Reproduced by permission of Prometheus Books.